When I received the Arctic Shield Boot Insulators I was pretty skeptical that they were anything more than a gimmick. However, I am pleased to say my skepticism was completely unfounded. 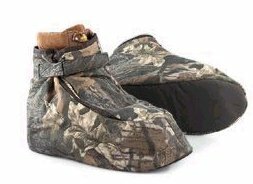 They are not a gimmick, and they really work on a problem that has affected hunters forever - cold feet. The boot insulators slip over your regular boots as an "outer" boot. You just slip them on once you reach your stand and then secure them with the velcro strap. They are meant for long periods of inactivity, and aren't really intended for use while walking or moving around. They're perfect for treestand or blind hunting for long periods in cold weather. They work using Arctic Shield's patented "RE-tain" technology which they claim will keep you warm regardless of temperature or windchill. "RE-tain" is not a traditional insulation, which is bulky and only slows heat loss. It is a thin multi-layered heat resistant thermal barrier that captures and returns up to 97% of your body heat. So, instead of slowing heat loss (like most insulations do), it actually traps the heat from your feet and keeps it in, keeping your feet continually warm. I tried them out primarily on some LaCrosse Burly 1200 rubber boots. While 1200 grams of thinsulate is a lot of insulation, there have been a number of times while treestand hunting during extended cold temperatures that my feet got not only cold, but very cold. I used the boot insulators all throughout the coldest part of the hunting season, and I was delighted to find that they really work like the company claims! I can say that my feet never got cold when I used them. In fact, there were a few times that my feet were actually sweating a little, they were so warm. This was in temps below freezing for more than a few hours on stand sitting absolutely still with no activity. That is something I had never experienced before, so I was pretty excited. Obviously, this means that you'll have to find another excuse for not staying in your stand longer, because you won't be able to use the cold feet excuse anymore. I also found the material to be very quiet, not "crinkly" or stiff as I kind of expected it to be. Lastly, they're convenient for packing, as they roll up and fit easily into any pack and even big coat or jacket pockets. The only thing I didn't like about the Arctic Shield Boot Insulators has to do with the velcro closures. I have mixed feelings about it. They make an excellent closure system, obviously, but as everyone knows, velcro is not quiet. You have to undo the velcro closure both to put the boot insulators on and to take them off again. If there are animals near your stand when you do this, it might alarm or spook them. I usually just rip the velcro strap apart as quickly as possible so as to shorten the length of the disturbance. I give a thumbs-up to any product that makes it possible for hunters to stay in the woods longer in defiance of the weather conditions or temperatures, so I highly recommend the Arctic Shield Boot Insulators to all hunters.